material from sticking together, strive to maximize lubricant service life. According to Joe Purnhagen, global commercial manager of metal processing additives for the Lubrizol Corp., Wickliffe, OH, oil-based metalforming lubricants have long-excelled at providing good service life and minimal maintenance requirements. In these fluid types, lubricant formulators are primarily concerned with additive solubility in the base oil, and achieving the right balance of different additives to meet the performance requirements of the given application. Emulsifier additives are the key components that allow for a lubricant to mix with water, and retain a stable mixture over an extended period of service. 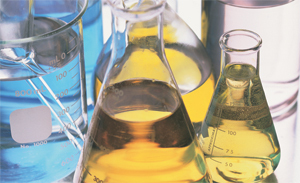 Various types of emulsifier additives are used in soluble-oil (milky appearance) and semi-synthetic (translucent appearance) metalforming-fluid formulations. The uncontrolled growth of microbes (bacteria or fungi) is one of the most common sources of emulsion degradation and reduced fluid-service life. Water-based metalforming-fluid emulsions contain an ideal breeding ground for microbes to thrive: water, organic food sources from oils and other performance chemistries, and typically a slightly elevated temperature from the service conditions. To keep microbial growth in check, lubricant suppliers introduce biocidal additives to the recipe, either as a fluid concentrate or as supplemental tank-side additions. Suppliers of quality metalforming fluids generally include some degree of service or training so that biocides are used safely and effectively with their particular products. The results of uncontrolled microbial growth can include product performance degradation, emulsion instability, loss of corrosion protection, foul odors and irritation or illness for shop-floor workers. Carby Corp., Watertown, CT, a deep-draw stamper operating some 70 Waterbury Farrel and U.S. Baird transfer presses, used to blend its own lubricants, but as suppliers of compounds started to discontinue some of their ingredients, the stamper looked to outsource lubricant formulation. One particularly challenging job Carby runs: severe deep-drawing of cosmetic brass parts, for ink pens. Angler Industries, Sterling, CT. Top of mind: recent EPA scrutiny of short-chain chlorinated paraffins, popular additives in metalforming lubricants. Both Harry Miller and Angler supply custom-blended lubricants, as well as cleaning compounds, to metalformer Carby Corp., Watertown, CT, a deep-draw stamper operating some 70 Waterbury Farrel and U.S. Baird transfer presses, rated to 75-ton capacity. Up until 2005, Carby blended its own lubricants, but as suppliers of compounds started to discontinue some of their ingredients, the stamper looked to outsource lubricant formulation. Among the products Carby now receives from Harry Miller is Hamilube 9900-C, a combination of oils, EP additives (chlorinated paraffins) and emulsifiers that allows Carby to severely deep-draw brass parts (90-10 and 70-30) to a strict cosmetic-finish specification. Draw ratios can exceed 30:1 on parts the company stamps for medical devices, writing instruments, electronic products and other applications. For his part, Coviello is acutely aware of the EPA’s close scrutiny of use of chlorinated paraffins in the metalworking industry, and so he’s taking a hard look at “green” compounds. “We’ve just begun to test vegetable-based products for stamping some of our nickel-silver parts,” he says, noting that not only will he evaluate stamping and drawing performance but also must consider sump life, cleanability and other factors. 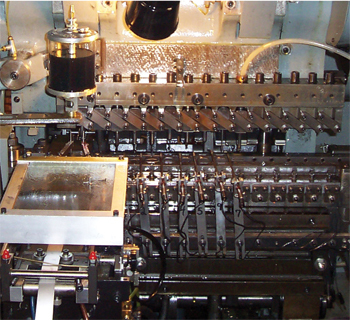 very useful information on Deep Draw applications, must read by every metal forming companies.